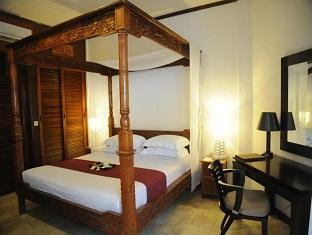 The 3-star Maharta Hotel offers comfort and convinience whether you’re on business or holiday in Bali. The hotel has everything you need for a comfortable stay. All the necessary facilities, including babysitting, business center, restaurant, airport transfer, laundry service/dry cleaning, are at hand. Designed and decorated to make guests feel right at home, each room comes with satellite/cable TV, coffee/tea maker, bathtub, DVD/CD player, internet access â wireless (charges apply). Access to the hotel’s garden, outdoor pool, massage, spa will further enhance your satisfying stay. Maharta Hotel combines warm hospitality with a lovely ambiance to make your stay in Bali unforgettable.